For veteran riders of the subway system, there is no better feeling of transit satisfaction than getting to the right spot to wait for a train based on where you want to go. I know, for instance, which set of doors on the Coney Island-bound Q train I need to be among the first people up the stairs at 7th Ave., and I know where to stand to optimize the transfer between the BMT and IRT at Union Square. Over the years, various tools have allowed New Yorkers more access to this information. The MTA’s neighborhood maps, accessible if you know where to look, help and so too does the Exit Strategy App. Now, though, a new effort by a group calling itself the Efficient Passenger Project is raising some eyebrows both in support and opposition to the effort. The idea is simple: Signs on subway platforms will guide riders to the best place to stand if they’re trying to transfer. Not surprisingly, the photo making the rounds shows a sign at the L train’s Bedford Ave. station highlight the switch to the 4/5/6 at Union Square. As the photo atop this post indicates, there are many more to come. Those reactions basically run the gamut from friendly to, well, expected. I appreciated the WNYC colleague who objected to the signs because “posting [the information] so flagrantly etches away at the quiet pleasure” of knowing just where to stand. Make of it all what you will. The MTA I understand frowning on this. These signs likely could have unintended consequences if people all try to crowd into one area. Exactly–this is already a problem at some stations where the entire car attempts to exit through a single set of doors. Part of the problem though is stations that do not have enough stairs or exits. Newbies and tourists have no idea what the hell a “4/5/6” is. All they know is green line, red line, yellow line and which train takes you to that big museum on Fifth Ave in Central Park. If you live here and you can’t figure out where to get off to optimize your transfer, you are already lost and there’s no helping you. Not necessarily. If it’s not a trip you make on a regular basis, I can see how somebody might not know what’s the best portion of the platform to stand at for a particular transfer. Depending on how saavy you are, you might be able to figure it out logically (for instance, logically, you should be towards the front of the train if you want to make the transfer from the B/D/F/M to the 6, because the trains are headed east, and Lafayette Street is at the east end of the station). You give tourists/newbies way too much credit to figure out any of this info. I’m not talking about tourists/newbies. I’m talking about people who ride the subway regularly, but may not be familiar with the best spot to make the transfer because they don’t make that particular trip. No mention of line colours there. And just using colours is no help if the train you want does not stop at a particular stop. And telling a tourist just to take the red line to get to the Statue of Liberty is not a great idea if they end up on a 2/3 train. 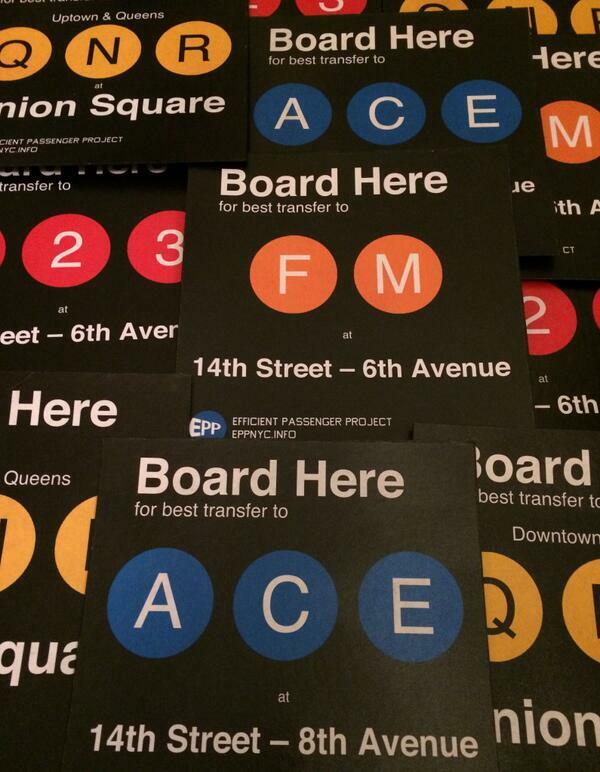 Any time I have asked anyone n NYC for advice on subway lines they always use the number / letter and never the colour. And as to optimizing transfers a lot of people prefer to stand where they get the best chance of a seat rather than making a quick exit – especially if their trip is several stops. That’s certainly my experience here in London. I think the MTA’s fears are overblown. Especially on longer trips, I much prefer an uncrowded car to saving 20-30 seconds on my commute. I love the “quiet pleasure” quote. Even Exit Strategy (which I use often) requires at least some effort. There’s already an iPhone app for this, called “Exit Strategy”. My wife has been using it for years. I’m more the type who enjoys figuring it out for myself. too bad they didnt fixed the andriod version of the pos app. I had this down to a science back in the early 1970s on the LL, for getting on at First Avenue at exactly the right door for the N/RR transfer at Union Square … except for the day 1575 (the R-10 prototype) came in as the car in the preferred location, and neither of the door leaves at that spot opened (they opened on the other side at Union Square, but such was the continued status of declining preventive maintenance in the 1970s). Santiago used this exact type of signage to AVOID overcrowding. Ever get off a train, walk a few feet left, turn around, walk right….trying to figure out where the way you want to go is? Ever been on the wrong end of the platform, and had to walk like a salmon against the masses to get to your stairway? Exactly. You could argue that BusTime makes buses unnecessarily more crowded, because if people see there’s a long gap in service, they could time themselves for the first bus that fills that gap. But the people who are in less of a rush will time themselves for the bus behind it, and everything balances out at the end. Because we will never live to see the day where the MTA can figure out how to keep buses from bunching into herds of three or four at at time. I don’t think any transit system has solved the problem of bus bunching – without resorting to blunt methods such as just making buses (and passengers) wait to achieve a head-way behind the first bus. All the GSP wizardry and techno monitoring won’t stop that as there are too many external factors that affect bus times – other traffic, accidents weather and delays caused by passengers. Maybe, though that can depend on the particular situation and on volumes. I wouldnt say this is always a good idea but it isnt always a bad one either and the MTA may be wrong to reject it outright. An example I can think of is where high volumes means that people will literally be unable to get off the train due to the bunching at the stairs. Ive seen this at the Lex-53rd Station on the E in the morning from Queens. Its a disaster. Could it just be that the MTA is annoyed they didn’t think of this first? I frequently use those ‘neighborhood maps’ to plan my position on the subway platform. While they are not 100% effective, using those and having a basic understanding of the route will do the trick in a pinch. “etches away at the quiet pleasure’ of knowing just where to stand.”–So, basically, that person is saying that they can only get pleasure if they know something others don’t and the other subway riders are at a disadvantage? Hmmm, not sure what to think of that. Right, because in that quotation it clearly says that’s the only way he derives pleasure. For once, I agree with the MTA. Ignorance is bliss. Most riders, truthfully, do not pay that detailed of attention to the system they use each and every day; while we may find this concept preposterous as individuals who have a certain degree of affection for our subway and public transportation networks, the fact of the matter is that it is true. These signs will do nothing but create first- and second-class riders who will feel cheated because they are not in the ‘best’ subway car, and will try to wriggle their way in. This is particularly disastrous for the BMT Canarsie-IND Crosstown Transfer, for more than obvious reasons. Leave the signs down. For once, less is more when it comes to information. Sometimes the ‘best’ carriage to be on isn’t the one closest to your exit but the one where you have a good chance of getting a seat or at least isn’t as crowded. I’d rather have a seat! But people are creatures of routine and no matter what you tell them the vast majority will just do what they have always done and stand on the platform where there entered the station rather than moving down. They will complain that they never get a seat even though a walk of a couple dozen yards may yield them one. If the MTA were truly interested in preventing crowding on platforms, they’d build more entrances (Ave A. on the L, anyone?) to spread out the loads, not willfully deprive riders of information that would make their trips quicker. With all due respect but your comment misses the main point. Take Times Square on the 1/2/3. Many entrances and steps leading up and down to those platforms yet people still crowd the front section of the platform. Some because they plan to exit at 72nd and 96th and others because they just don’t feel like walking to a less crowded section of the platform. The point the MTA is making is that they don’t need someone advertising where to stand causing more crowding in one particular section of the platform. It’s dangerous for many reasons that most here are missing. First it forces more people who want to get by to walk along the yellow edge. Second, as conditions becomes more crowded those who are standing dangerously close to the edge have less of a means for standing back, as a matter of fact it seems to embolden some to stand closer as to make sure they are the first to board the train. Third, such a sign increases the MTA’s legal liability in case of an incident. Someone can claim they were injured by train or crowding conditions because of the signs. If they allow the signs to remain who’s buying the problem? Why does the person posting them wish to remain anonymous? Yeah for good reason, he doesn’t need the headache, right? So let the MTA handle that right? LOL and they’re not even posting the signs. Fourth, at large transfer stations the number 1 cause of delays is uneven boarding and discharging. While 7 cars remain relatively free of room you have people boarding and or getting off from the same 3 cars of the train and while the rest of the train is finished and ready to go we all sit and wait for those who want to squeeze in the same 2 door ways for some ridiculously strange reason when walking a door way or two down would make a world of difference for EVERYONE. Nah, somebody else mentioned it. It amazes me that people on Metro North going to Grand Central don’t crowd the front and back cars at early stations. Hm? They do. The ones who aren’t antisocial/claustrophobic at least.